Manchester City have been slapped with a £35,000 fine for failing to control their players, while Chelsea will have to pay £100,000 for repeatedly breaching FA rules on player conduct. Chelsea and Manchester City have been fined by the FA for failing to control their players during a Premier League match at the Etihad earlier this month. Manchester City and Chelsea clashed at the Etihad earlier this month. Sergio Aguero's rash challenge on David Luiz sparked a huge brawl between the two sets of players in the final minutes of Chelsea's 3-1 win away from home. 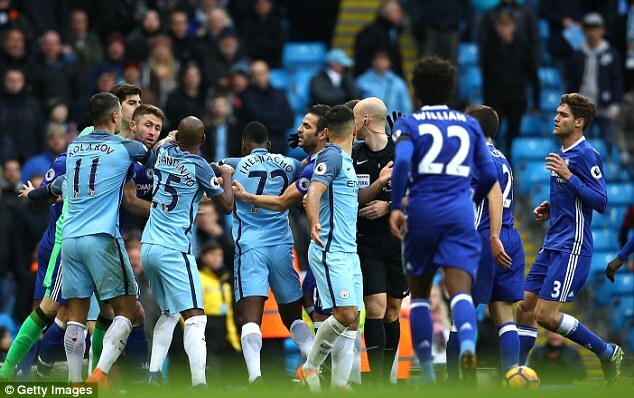 Manchester City players, Aguero and Fernandinho were both sent-off for their part in the melee, while Cesc Fabregas and Nathaniel Chalobah were also booked by referee Anthony Taylor.